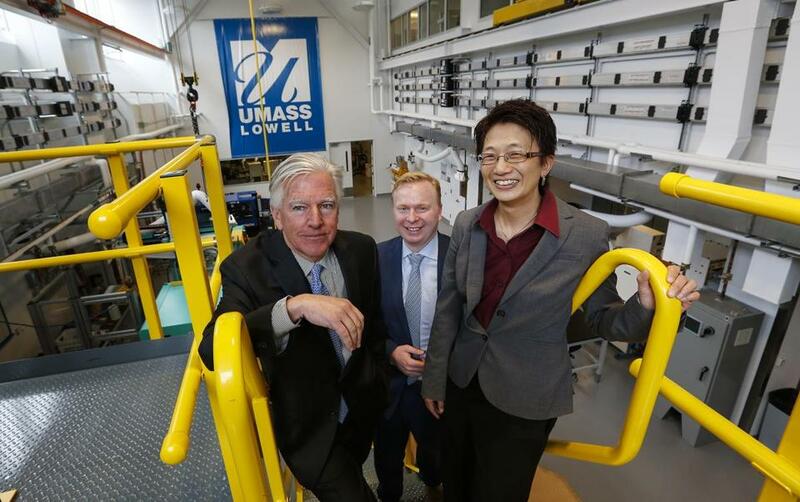 UMass Lowell Chancellor Marty Meehan, Strategic Marketing Innovations Chief Operating Officer Bill McCann, and Vice Provost Julie Chen stood in a laboratory at the universit’s Saab Center. WASHINGTON — Former US representative Marty Meehan stood before a gathering of defense contractors and military officials recently at UMass Lowell, the once-sleepy campus that has seen explosive growth under his leadership as chancellor. Embrace it, indeed. Since retiring from Congress in 2007 and taking over UMass Lowell, Meehan has presided over one of the most effective networks for securing taxpayer funds and corporate research dollars for a university, drawing especially from the Pentagon and defense companies such as Waltham-based Raytheon. Research and development funding at UMass Lowell has grown from $36 million when Meehan arrived to more than $66 million this year as a result of federal grants, a series of corporate partnerships, and other public and private sponsors, according to university data. 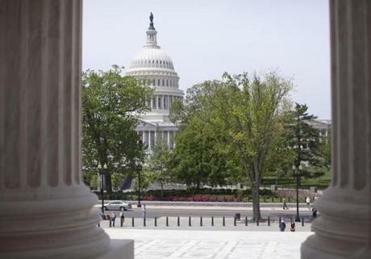 A series examining the ways industry, lobbyists, and academia influence government decision-making, from the Globe’s Washington bureau. The university’s pipeline to taxpayer and private-sector research dollars is in many ways a triumph of lobbying and exemplifies the clout wielded by former Washington insiders. UMass’s chief Washington lobbyist is Bill McCann, an Andover native who served as Meehan’s chief of staff when he was in Congress. The school also has a key supporter in Meehan’s successor in Congress, Representative Niki Tsongas, who replaced him on the influential Armed Services Committee. At the top of this power structure sits Meehan, who has close ties to federal agencies, members of Congress, and corporate CEOs from his decade and a half on Capitol Hill. Moreover, the 57-year-old former lawmaker wields a $4.1 million campaign warchest left over from his House years, from which he can dole out money to select office-seekers, including those who help fund his school. With the unexpected resignation earlier this month of UMass president Robert Caret, Meehan is among those mentioned as a possible candidate to take over as head of the UMass system. Meehan’s access and ability to connect university faculty and research with key decision-makers in Washington are assets not only for UMass Lowell but for his former chief of staff’s company. According to lobbying disclosure records, McCann’s Strategic Marketing Innovations firm, which represents nine universities and a host of high-tech companies across the country, has earned nearly $1 million in fees from UMass Lowell since 2005, when McCann stepped down as Meehan’s chief of staff and went to work for the company. Some critics say Meehan’s and McCann’s efforts raise fundamental questions about how taxpayer money is funneled to institutions whose leaders have powerful political connections. UMass Lowell used to be derided as “U-Lowell” or “Lowell Tech” — labels meant to suggest it was not in the same league as other Bay State universities or even some fellow branch campuses in the University of Massachusetts system. With the influx of taxpayer dollars, corporate partnerships, and aggressive fund-raising, enrollment has increased 50 percent since Meehan took over in 2007, to more than 17,000 students this fall. The campus has opened 10 buildings in the last five years. Its academic programs have steadily climbed the national college rankings. 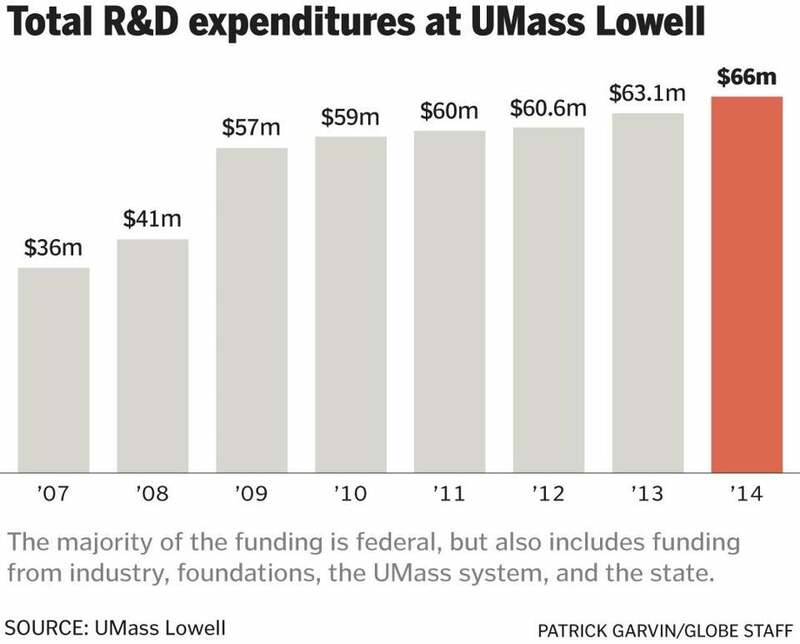 UMass Lowell still falls far short of attracting the level of funding that other, higher-profile research universities can. For example, the total research and development expenditures of Massachusetts Institute of Technology recently topped more than $700 million, according to a report by the US Patent and Trademark Office. MIT’s Pentagon research alone — more than $80 million in 2012, according to the most recent official data — is more than all of UMass Lowell’s annual research funding combined. But, for UMass Lowell’s size, federal and corporate funding is steadily turning the campus into a regional powerhouse. Federal dollars account for more than three-quarters of its research and development funding, according to the university. The specific sources of the funds have fluctuated in recent years but the largest is currently the Pentagon, followed by the Department of Health and Human Services — which includes the National Institutes of Health — and the National Science Foundation. Other grants come from the Environmental Protection Agency, the Department of Education, NASA, and the Department of Energy. The flow of dollars from Washington has helped to transform the campus, which boasts a new $95 million student center known as University Crossing and will soon have ground broken for a business school. A direct result of the federal support for research is the $80 million, 84,000-square-foot state-of-the-art Mark and Elisia Saab Emerging Technologies and Innovation Center, a four-story building that opened in October. It is billed as a “hub for developing advanced manufacturing and other technologies” for military, medical, and other uses. Some of the seed money for the center was a $10 million grant from the Army that Meehan and McCann helped secure when they were working together on Capitol Hill. The funding was for “printable electronics,” the process of embedding small electronic devices, such as computer chips, in materials ranging from clothing to paper. Other significant funding has since come from the Pentagon as well as the National Science Foundation. Another key source of financing for both the military and medical-related work at UMass Lowell is private industry. By partnering with the university to seek government grant funding, companies see the opportunity to leverage the university’s research to develop new products and to access a highly skilled workforce. No company has invested more in UMass-Lowell research than the defense contractor Raytheon. Raytheon Co. is the nation’s fourth-largest defense contractor, with more than $22 billion worth of defense-related revenue in 2013. The company has an estimated 63,000 employees worldwide, including an estimated 1,000 UMass Lowell graduates. Lately, parts of UMass Lowell itself have begun to resemble some of those Raytheon divisions. Raytheon will operate the top floor of the new emerging technologies center under a joint project announced in August. The company is committing up to $5 million over the next decade for the RaytheonUMass Lowell Research Institute, which is billed as a “first-of-its-kind partnership” to put top Raytheon researchers on campus. 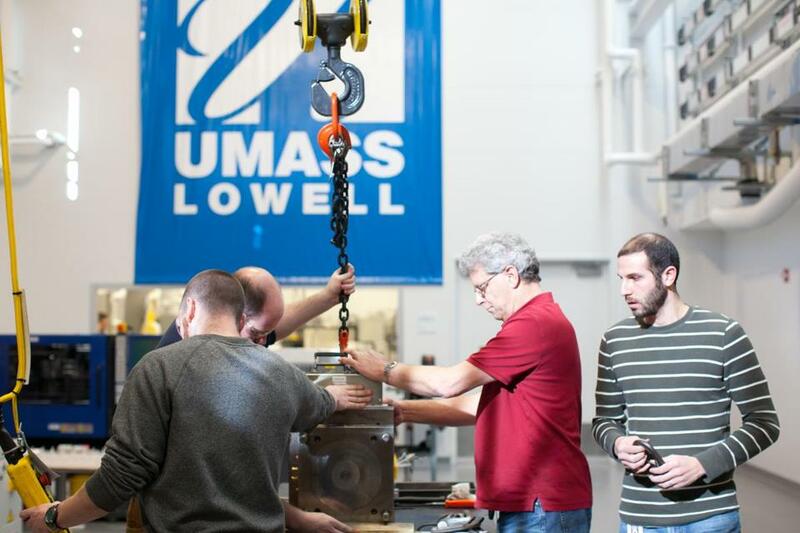 Molding Supervisor Al Bernier, in red shirt, and Sal Lograsso, a flow simulation engineer, at right, worked with UMass doctoral students Greg Pigeon, foreground left, and Jim Wirwille to move a mold into an injection molding machine. Earlier this month, UMass announced an even bigger commitment from the Waltham-based defense giant, saying Raytheon will finance a UMass Lowell campus in Kuwait, a $50 million allocation that will be spread over seven years. The deal, which partners with the Gulf University for Science and Technology, is also a first of its kind: The defense company is using the investment to meet its so-called “offset” obligation to invest in Kuwait in return for the country’s purchase of billions of dollars worth of high-tech weaponry. Raytheon said in a statement that it plans to continue investing in the university and said the funds will be “focused at exploiting [UMass Lowell] research strengths that align with the strategic needs in advancing radar and communication technology at Raytheon.” The company did not respond to questions about its relationship with Meehan or McCann. But their longtime ties to the company played a key role in the new partnerships. McCann, when he was on leave from Meehan’s congressional staff and attending business school, had an internship with Raytheon’s top lobbyist in Washington. As a lobbyist he has also represented some of the company’s key suppliers, including kSaria, a fiber optic manufacturer based in Methuen. Meehan, during his service on the Armed Services Committee, including a stint on its research and development subcommittee, was a leading advocate for the company’s weapons programs. Overall, it was a mutually beneficial relationship: Campaign finance records show that Raytheon was also the fifth-largest source of donations to then Representative Meehan — for a total of $44,000 between 1991 and 2008, according to Opensecrets.org, which compiles campaign finance reports. Indeed, Meehan said one of the first people he went to see when he was named chancellor was William Swanson, then chief executive of Raytheon, to discuss how the two institutions might work more closely together. “There was a lot of interaction with Raytheon,” Meehan said of his career in and out of government. McCann was a key participant in the discussions between UMass Lowell and Raytheon to establish the on-campus research center, and he also played a key role behind the scenes coordinating the Kuwait deal with Congress and the embassy of Kuwait in Washington. The pair have similarly brought other private sector sponsors to campus. For example, another major industry partner in UMass Lowell’s nanotechnology research is Triton Systems of Chelmsford, which specializes in advanced materials engineering. Meehan said he first broached the idea of linking the two institutions when he was still serving in Congress, when Triton was his third-largest campaign contributor, donating nearly $50,000 between 1991 and 2008. Since then McCann has worked as a lobbyist for the company, earning his firm more than $500,000 in lobbying fees, according to disclosure reports. Triton did not respond to a request for comment. Shortly before Meehan was named chancellor of UMass Lowell in 2007, he was asked by The Lowell Sun about the lobbying work done by his former chief of staff, McCann, on behalf of the school. The newspaper said that McCann had helped secure “earmarked” congressional funds for the school, some of which had been inserted by Meehan. He said that it would have been in the university’s interest to keep him in Congress, not hire him as chancellor, because he was so effective in getting earmarks. But the university saw it differently and soon announced Meehan as chancellor. Meehan, asked about the 2007 comment, said he was expressing the view that the university did not need McCann to get his support in Congress for its programs. In any case, as chancellor he soon renewed his former staffer’s lobbying contract with the university, saying it was necessary in order to compete with other universities for federal dollars. In the meantime, the way members of Congress and lobbyists direct federal money for specific purposes has changed as a result of the ban on some types of earmarks that took effect in 2011. Today, although funds are still given out for specific projects, the recipient is often selected by a federal agency. McCann’s company, SMI, which was founded in 1992 and says it has secured more than $1 billion for over 100 clients in the last eight years, has adapted to the new rules. It taps into a stable of former government officials, retired generals, and other consultants — who are either paid on a case-by-case basis or on retainer — to help get the attention of the right decision-makers in federal agencies, who can then direct the general R&D funds approved by Congress. Meehan considers the SMI model to be at the forefront of the influence business. Then there is the presence of Meehan himself. Although not a registered lobbyist, he frequently connects with members of Congress and other key decision-makers. Indeed, as the head of a university, he was not bound by the one-year “cooling off” period that prevents other retiring lawmakers from directly engaging in official business with former colleagues who are still in office — an exception outlined in the lobbying laws. One key Meehan ally on Capitol Hill has been Representative Tsongas. She has used her influence to ensure key grant programs remain funded and has organized meetings on the UMass Lowell campus in recent months with industry and military groups to increase their interests in investments in, and cooperation with, the university. Meehan, unlike McCann, does not meet the threshold for registering as a lobbyist; federal rules say only a person whose lobbying makes up at least 20 percent of his work has to register. As a result, Meehan does not have to disclose with whom he meets on Capitol Hill or at a federal agency. That troubles some observers who say that Meehan should voluntarily make such disclosures. It has been seven years since Meehan left Congress. But his Marty Meehan for Congress Committee has never stopped operating. It still has $4.1 million, and under federal rules Meehan is allowed to distribute that money how he likes, spreading his influence further, including among those who help steer funds to UMass Lowell. For example, Meehan has given $13,000 since 2008 to Tsongas, according to campaign disclosure reports. Tsongas, in an interview, says she works tirelessly for the university because she believes in it, not because Meehan continues to support her election campaigns financially. She, in turn, applauds Meehan’s efforts.